Treat this land like your own private garden. Come explore, harvest, cook, and unwind like you would in your own backyard. Noci Sonoma’s founder, Chris Adjani (who prefers to be called Adjani), a husband, father of two, and former design professional, says his passion for the living project goes back all the way to his childhood. As an adult living in Los Angeles, Adjani nurtured his early passion for the simple pleasures of farm life, creating space for planting and harvesting wherever he could. After deciding that a farm was in their future, Adjani says he and Aria explored areas from their own backyard to quiet towns in Italy before finding the 24-acre plot that is now home to Noci Sonoma. Originally purchasing the land with the intent of housing sheep, pigs, and other livestock, their vision eventually shifted to one of shared gardening, cultivating, and cooking. Two years and 11 buildings later, Noci Sonoma is preparing for its initial opening this summer. Members can come and explore the developing land, harvest rows of fresh strawberries and blackberries, and gather their own bouquetfrom the property’s cut flower gardens. Those that want to spend a little more time enjoying the property can head to Provisions, the on-site market, and grab fresh breads, cheeses, and wines to savor on one of Noci Sonoma’s decks or outdoor kitchens. Fresh homemade pies, pastries, and ice cream, made by Adjani’s wife, Aria, are also staples of the property’s fare. A father himself, Adjani says kids are more than welcome in Noci Sonoma’s gardens. 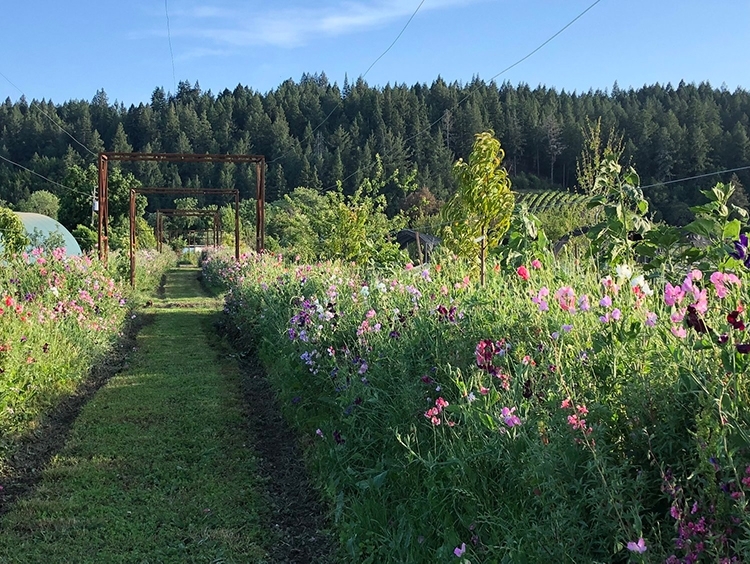 An entirely different kind of garden experience than most are used to, Adjani says his hopes are high that Noci Sonoma’s members and visitors will relish in the fact that the garden was developed for a different purpose than most. What advice do you have for people who like the idea of planting and harvesting their own food, but may not know where to start? Do you have any favorite outdoor tools you rely on at Noci Sonoma? “The Trailblazer flashlight is awesome. I’m out on the property at night all the time, and I don’t head out without it. It’s waterproof, it’s bright, it’s adjustable. Its old school design turned out to be perfect. What’s the greatest thing you’ve learned from fatherhood?